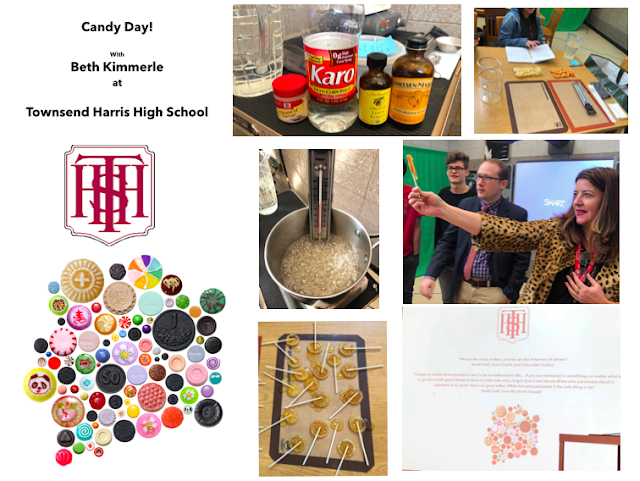 I went back to school last month and did something I have never done before....I made candy in a high school library! Townsend Harris High School is located next to the Queens College campus and is consistently ranked among the best public high schools in the country for academics. If you want to read more about how the savvy and brilliant kids at this High School are ready to take on the world read about what they did last year. Is it not every high school kids fantasy to help fire the rude and imperious principal? These same kids are working on a project close to my heart all about candy history in New York. In February I met them at the classic Lexington Candy Shop to enjoy a shake with John Philis, the third generation owner. Before I knew it I was offering to make candy with them. A few weeks later we pulled off this amazing and likely never done before feat. We crafted delicious fruity lollipops in a library. I ended my Candy Day! with a slide offering this quote from Roald Dahl's book My Uncle Oswald.